Here we go again. Because the fiscal cliff deal left the debt ceiling issue untouched, Americans can count on a rerun of the mid-2011 “debt ceiling” debate over whether the United States government should be allowed to pay its bills. 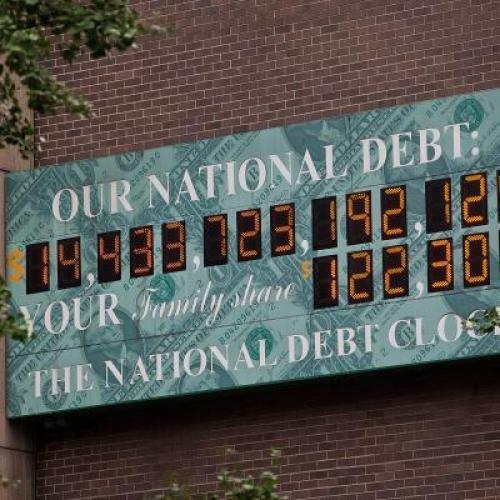 The deadline for lifting the debt ceiling will come in a couple of months, right around the time when $120 billion in 2013 sequestered spending cuts ($1.2 trillion over ten years) from the last debt ceiling fight will start to take effect absent Congressional action. It's generally agreed that Obama and the Democrats did a poor job of handling the debt ceiling fight last time. Will they now do any better? It’s possible, but only if they heed the political and public opinion lessons of the last go-round on the debt ceiling. Start with the “adult in the room” fallacy. That’s the idea that the President, by appearing to be reasonable and willing to make big concessions to his opponents, will gain a commanding political position. But taking the high road didn't work last time and it won’t work this time either. Back in 2011, the public did indeed perceive Obama as being more willing to compromise and blamed him less than Republicans for the difficulty of reaching an agreement. But his overall approval rating nevertheless plunged as the public got sick of teetering on the brink of disaster while the economy sputtered. In fact, his approval went down the most (16 points) among political independents, supposedly the audience most receptive to the adult in the room act. Second lesson: Cutting popular programs is unpopular. Last time around, significant cuts to Medicare, Medicaid and Social Security made their way made their way into various “Grand Bargain” proposals floated by Obama in negotiations. These were ultimately spurned by Boehner and colleagues, but Obama might not be so lucky this time. Better to avoid the trap by remembering these findings from a July 2011 CNN poll on possible components of a debt ceiling deal. While two-thirds of the public supported, in the abstract, the idea of cutting spending to solve the deficit problem, the public opposed cutting spending on Medicaid by 77-22, cutting Social Security spending by 84-16 and cutting Medicare spending by 87-12. This suggests that Obama should let Republicans go first in proposing such cuts and then mercilessly and publicly pillory them for their approach. Third lesson: Economic growth is much more important than deficit reduction. Obama, by virtue of his temperament, pressure from elites and, of course, the priorities of Congressional Republicans, will be tempted to privilege debt reduction over economic growth as he reaches for that elusive Grand Bargain. But he should remember that, as far as the public is concerned, you can’t eat Grand Bargains. That is, no matter how much the public says it cares about deficit reduction, ordinary people, unlike elites and their pressure groups like Fix the Debt, care far more about the state of the economy and how it is progressing. That has not changed since 2011: in Democracy Corps’ postelection poll, voters, by a thumping 62-30 margin, said that our biggest priority after the election should be growing the economy, not a plan to reduce the deficit. Thus, if deals have to be cut with the GOP, it should be with that priority in mind; a “grand bargain” on deficit reduction that does nothing for growth is a political loser. Obama will get little credit for the deficit reduction and plenty of blame for the lack of growth. This lesson assumes additional urgency given the already-existing drag on the economy from the fiscal cliff deal. Chiefly due to the expiration of the payroll tax cut, growth this year will be .4 to .6 percent less than it otherwise would be. Add to this other scheduled fiscal changes, including the sequestered spending cuts, and you have an austerity package amounting to 1.9 percent of GDP, greater than the austerity packages enacted in the UK in the last two years. The economic results there should underscore the need to promote, not retard, growth in coming negotiations. These lessons call for a degree of toughness in Obama we have not yet seen. He should not only refuse to negotiate with the Republicans on the debt ceiling, he should evoke all the extraordinary powers at his disposal—including platinum coins and a creative reading of the 14th amendment—to make that position credible in even the most dire circumstances. He should actively seek to get Republicans to show their cards on cutting Social Security and Medicare, rather showing them his. He should put the need for growth and jobs front and center, rather than the elite-led drive to fix the debt. And in all this he should be unafraid of, indeed welcome, the opportunity to take his case to the public and contrast his priorities with those of his opponents. In the end, it should come down to a debate over deficit reduction in the abstract (popular in polls) versus protecting popular programs and promoting economic growth (even more popular). This is a public discussion Obama is likely to win if he has the courage to pursue it.